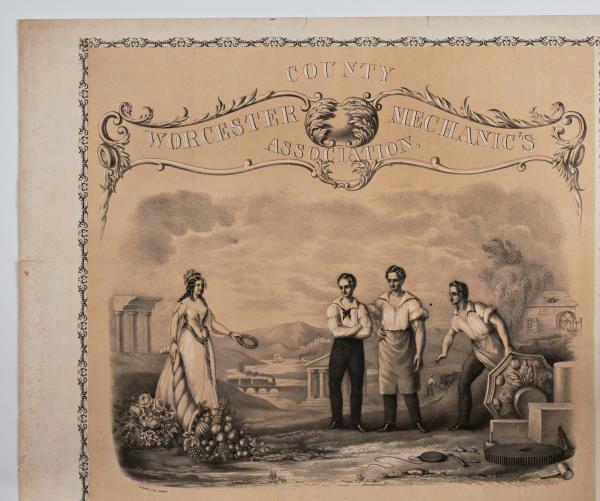 This image appeared on a lithograph announcing the first exhibition of the Worcester County Mechanics Association held in 1848. It depicts Columbia as a beautiful muse offering a horn of plenty and a laurel wreath to three strong, handsome young mechanics. At their feet are various tools and gears of the mechanical trades. In the background can be seen a mill, a railroad and a farmer plowing his field all within a pastoral landscape. The background also contains classical temples some still under construction, representing the great new American nation being built upon the classical Greek and Roman democratic traditions. The Worcester County Mechanics Association was like many other mechanics associations formed throughout the country during the antebellum period to promote the mechanical arts, provide instruction and training, and to offer assistance to mechanics and their families who might be in distress due to illness or loss of employment. At this period a mechanic was defined as anyone who worked with their hands in the mechanical arts and included a wide diversity of professions including: blacksmiths, pipe fitters, draftsmen, engineers and architects to name just a few. The Worcester Mechanics Association, founded in 1842, formed a lending library, offered classes in the mechanical arts and sponsored lectures as well as exhibitions. They eventually collaborated with the Worcester County Lyceum and the Worcester Public Library to offer lectures on a wide variety of subjects including social reforms such as temperance, women’s rights and anti-slavery. Many of the great social, cultural and political figures of the time spoke under the auspices of the Association including: Ralph Waldo Emerson, Charles Dickens, Henry Ward Beecher, John B. Gough, Lucy Stone, Abby Kelly Foster, Charles Sumner and Daniel Webster. In 1857, the Society would build a magnificent building to house their operations. Worcester’s Mechanics Hall still stands today and is considered one of the finest examples of pre-Civil War concert halls in existence. The Association held five Mechanics Fairs in 1848, 1849, 1851, 1857, and 1866. At these fairs they sought and displayed a wide variety of materials and awarded medals and certificates of merit for the finest examples of American-made inventions and materials. This advertisement for the first fair includes the following categories: agricultural implements; new inventions of machinery; edge tools and cutlery; pumps, stoves, ranges, and furnaces; brass, copper, tin and Britannia ware: silver ware, jewelry and lamps; mathematical and school apparatus; musical instruments; clocks and watches; canes and umbrellas; domestic woolen goods; cotton and linen goods; carpets, rugs, and floor cloths; paper hangings; cabinet furniture; piano forte cases; surgical instruments; dental instruments and dentistry; marble work; imitation of wood and marble; book binding and printing; china, glass, and earthen ware; hats, caps, and firs; boots, shoes, and findings; sole leather, calf skins, and morocco; harness work, saddlery and upholstery; hosiery and clothing; worsted work and embroidery; needle work and millinery; bead and wax work; paintings and daguerreotypes; engraving and lithography; confectionery and perfumery. Dimensions: 64 x 43 cm.